This intuitively-operated instrument is ideal for lamp and luminaire manufacturers, installers and lighting auditors who want to control and improve the quality of LED lighting products. From incoming component testing, through the research and development up to the final product testing and verification. Measure any light source and get the results you need. Evaluate products meet spec before you buy, develop products faster, or ensure your products are manufactured properly. The Spectis 1.0 Touch can do it all. Keep up on the latest industry requirements and metrics with our lifetime upgrades. From standard quantities like spectrum, lux and CCT to new requirements like TM-30, PAR/PPFD and EML. 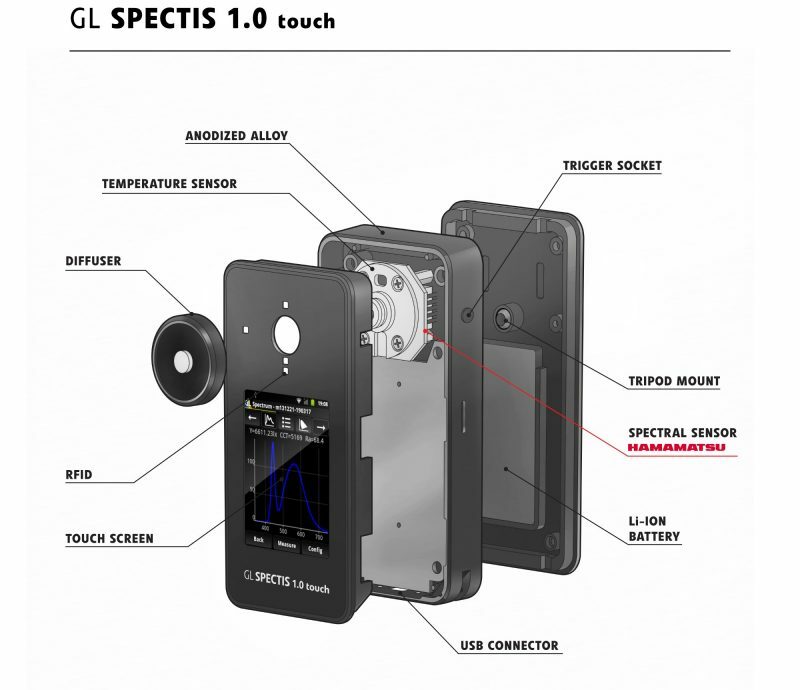 The Spectis 1.0 Touch spectral meter is unlike any other handheld on the market. With a range of interchangeable accessories the Spectis can grow with your business from standard illuminance (lux / fc) measurement to luminous flux (lumen), and luminance measurement. Simple way to turn your illuminance spectrometer into the single LED tester to measure luminous flux and color CRI and TM30 rendering properties of LEDs. 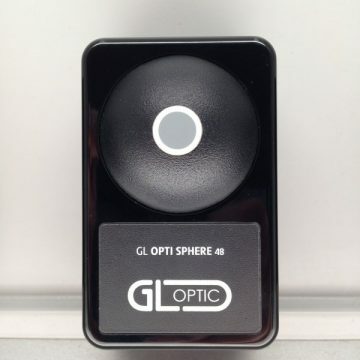 Install the GL OPTI SPHERE 48 which mounts directly on the device and measure. This can be used as portable set but also can be installed in the lab or production for quick and precise LED testing. 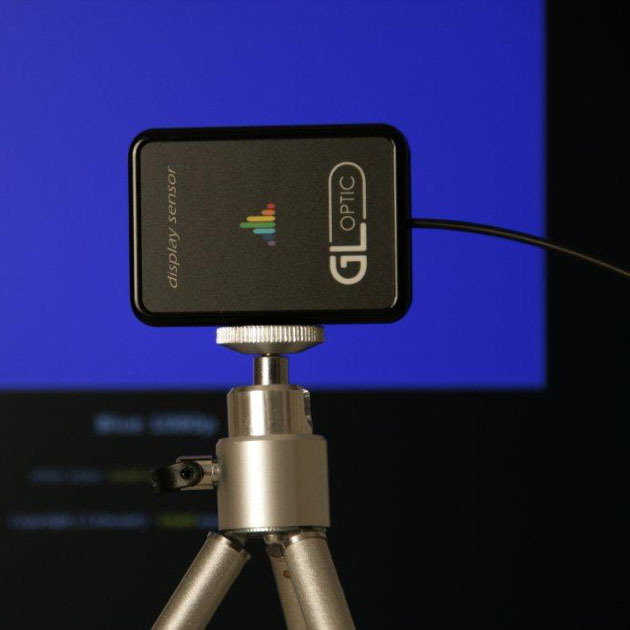 Any flat light emitting surface can be measured with Spectis 1.0 Touch when you use optional Opti Probe 1.0 for luminance and radiance. 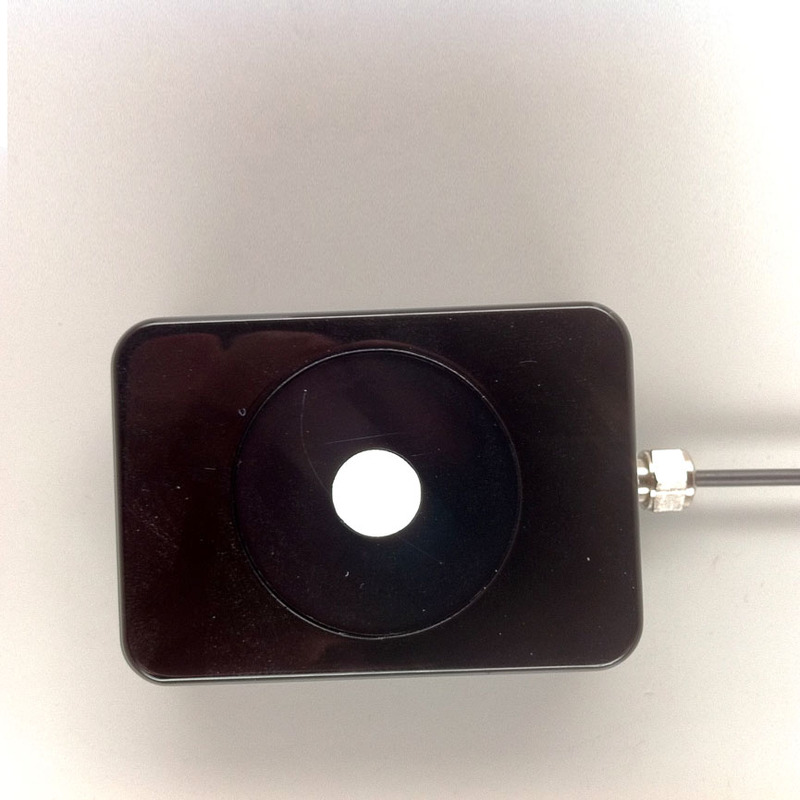 This accessory connects to the spectrometer with fiber optic connection and can be installed on a tripod at a distance from the test device or put directly on the LED or OLED surface to measure cd/m2, SPD and radiance. If you are developing or distributing Aquarium LED lighting you can connect our LED light meter with optional water tight probe design for evaluation of lighting installations dedicated to submarine, aquarium or other underwater technical lighting. 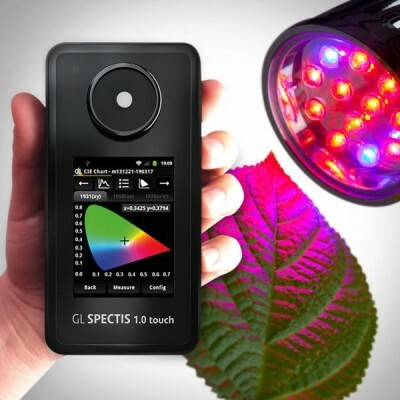 Horticulture or Agriculture lighting applications you can use our spectral light and PAR meter to evaluate any effective irradiance values. Onboard firmware can calculate PAR, PPFD and other critical parameters of modern specialized LED lighting installations. 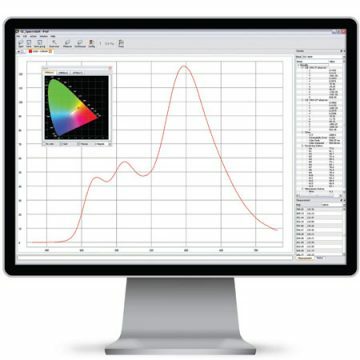 Connect to our Spectrosoft tool for advanced analysis options. The GL SPECTIS 1.0 Touch was designed based on the experience gained from our original non-touch screen model, the Spectis 1.0. Our goal was to create a spectral LED light meter for customers who wanted to have a simple solution without any sacrifice in optical performance and dependability. This battery-operated standalone device is ideal for different light measurement applications – from the laboratory to field testing. Through extensive engineering in the design and calibration procedures, this device provides the highest accuracy of any handheld spectral light measurement device. 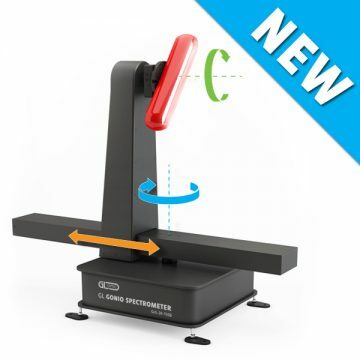 We understand that light measurement is not an easy task, but thanks to the Spectis 1.0 Touch, you no longer need to be an expert to make professional LED lamps evaluation. This light measurement instrument is designed for those who value quality and high technology solutions. It includes many technical features and superior components offering a unique combination of laboratory accuracy and ease-of-use. It is a must have for any lighting professional looking to build its competitive advantage by improving the quality of LED lamps, modules and luminaires. The standard light spectrometer covers the visual range measurements of LED, OLED, CFL, discharge lamps and other light sources. Need to measure outside the visual range? Check our VIS NIR model. Use any of our additional accessories and software options for advanced applications. The Spectis 1.0 Touch spectral light meter comes standard with Class measuring head as a standard accessory for proper measurement of illuminance (lux). The instrument does not require a computer connection to carry out the measurements and the relevant data is immediately displayed on the color touch screen. This handheld spectral light meter uses a proprietary mechanism to detect which optical probe has been attached and automatically applies the correct calibration file for that accessory. This enables the user to confidently avoid measuring errors when changing accessory interfaces. The calibration meets the requirements of leading standards institutes and is confirmed with a manufacturer’s certification. 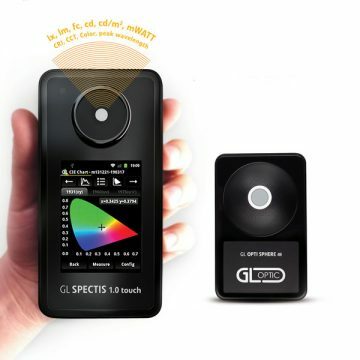 The Spectis 1.0 Touch spectral light meter is ready to provide very accurate measurements for almost any lighting condition. A temperature sensor installed on the electronic board monitors changes in temperature and automatically compensates for any change in the system noise, providing excellent measurement stability. For automated or production applications, you can use the trigger socket to synchronize spectroradiometer with external systems. For example, the signal from the socket can trigger the flash of a tested lamp during measurements. Each system is delivered with an absolute spectral calibration with traceability to National Labs and using industry best practices. Obtain absolute values such as Lux, Candela and Lumen together with radiometric values depending on the measurement accessory installed. Whatever your application, our precise SPECTIS 1.0 GL Touch is ideal. The newest GL Gonio Spectrometer for DUT up to 1500 mm.